Self defense in your pocket or purse. 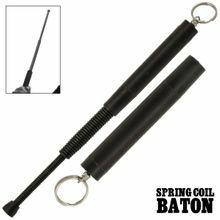 Weighing almost 8 ounces this telescopic spring steel baton opens to 12 inches to increase your reach and make your strikes more effective. This nifty keychain extends to fighting length with the flick of a wrist. Can be used in the closed position as a kubaton as well. The handle is crosshatched to help you maintain your grip. Strong steel keyring included. Add a carrying pouch you can wear on your belt for only $1.25 while supplies last. No shipping to NY, CA, MA or outside the USA.